The scriptural usage is not in reference to anything Christian, but in reference to the celebration of a Pagan holiday familiar to most people in the first century. The word is used simply as a marker of time indicating a time when Herod planned to free an imprisoned Peter. Notwithstanding, there has been an evolution over the centuries attributing the word Easter to Christianity. Specifically, Easter refers to the atonement and resurrection of Christ after the crucifixion. From the Biblical perspective, the lead up to the crucifixion was connected with the Jewish observance of Passover. The crucifixion was to be completed just prior to the Passover. Our Savior lived again. The most glorious, comforting, and reassuring of all events of human history had taken place—the victory over death. The pain and agony of Gethsemane and Calvary had been wiped away. The salvation of mankind had been secured. The Fall of Adam had been reclaimed. The empty tomb that first Easter morning was the answer to Job’s question, “If a man die, shall he live again?” To all within the sound of my voice, I declare, If a man die, he shall live again. We know, for we have the light of revealed truth. The Christian interpretation of Easter is the climax or culmination of the Passion of Christ. Mormons are Christians. The Passion of Christ has to do with the events and suffering – physical, spiritual, and mental – of Jesus relating to the atonement and his subsequent resurrection, breaking the bonds of death. In most Christian churches, the passion is directly related to the hours before the actual crucifixion including his trial and subsequent execution. Thus in Catholicism, the Stations of the Cross figure prominently into the Easter celebration as adherents contemplate the atonement and resurrection. In Mormon theology, Easter also figures prominently, albeit somewhat differently than with our Catholic brethren. Mormons simply do not incorporate the cross into their worship of Christ. The Question of why Mormons do not incorporate the cross into their Worship of the Savior and God can be explained in this way. Mormons make the comparison of the cross to the weapon and subsequent infliction of death used to kill Christ. Christ’s death was part of the Plan of Salvation. It is a way for a fallen man/woman to redeem himself before God through the expiatory action (ability to actively receive forgiveness) of the atonement. The atonement provides a way that Justice is served and at the same time —through the atonement— the law of mercy allows us to correct our breach of justice and return to God conditionally upon our acceptance of Christ’s sacrifice and atonement. Mormons take the position that the crucifixion on the cross is the ultimate act of love by Christ, however the Mormon belief is that the physical, spiritual, and mental aspects of the atonement were suffered mostly in the Garden of Gethsemane prior to the crucifixion. Hence, Mormons do not display crosses or utilize the cross as a symbol of the sacrifice of the atonement. 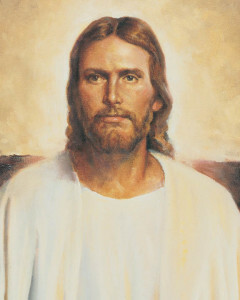 If you go to a Mormons chapel you may see a simple picture of Christ, or no religious artwork at all. However, in the halls and foyer you will see many paintings or pictures depicting Christ, His apostles or other important gospel topics. In some ways this analogy of the use of the cross is given …suppose someone you loved very dearly was murdered with a gun. Ask yourself if you would wear a small gun on a chain or pendant to remind and memorialize what happened to your loved one. Mormons regard the cross in much the same way. Mormons, however, acknowledge the atonement and resurrection as the pivotal events in all history. 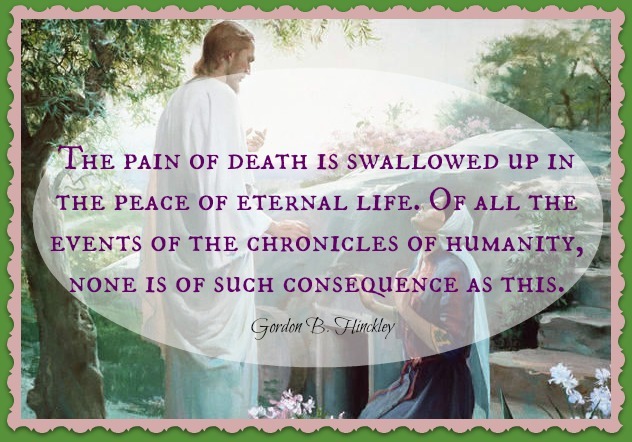 Mormon faith centers upon the resurrection and atonement of the Lord Jesus Christ. I have read—and I believe—the testimonies of those who experienced the grief of Christ’s Crucifixion and the joy of His Resurrection. I have read—and I believe—the testimonies of those in the New World who were visited by the same risen Lord. I believe the testimony of (Joseph Smith) … who, in this dispensation, spoke with the Father and the Son in a grove now called sacred and who gave his life, sealing that testimony with his blood. Of the experience, Joseph Smith recounted “And now, after the many testimonies which have been given of him, this is the testimony, last of all, which we give of him: That he lives! For we saw him, even on the right hand of God; and we heard the voice bearing record that he is the Only Begotten of the Father (“He Is Risen!” Liahona, May 2010) . Mormons have no dietary restrictions during Lent or the Easter season. 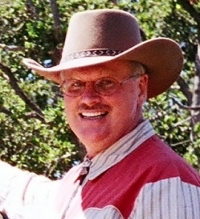 The only prohibition is that in the Word of Wisdom (the Mormon health law), it specifies that meat should be eaten sparingly, but the restriction applies year-round, not just during the Easter season. The intent of the Easter season among Christians is to effectuate a spiritual transformation. Mormon teaching fits nicely within this goal; however, it is a year round struggle, and many of the Easter observances are practiced monthly and weekly in Mormonism during the years rather than only during the Easter season. This article was written by Mel Borup Chandler, a member of The Church of Jesus Christ of Latter-day Saints.